The Sahara Force India driver pairing has been rather combative this year, with Esteban Ocon and Sergio Perez making contact in Baku and now again in Spa. As they approached Eau Rouge on lap 29, the two drivers were running close enough together that action looked imminent. But rather than fighting cleanly, Perez squeezed his teammate into a narrowing gap to the wall. The pair made contact, Ocon lost a chunk of front wing, and Perez suffered a puncture. As Perez started to limp back to the pits -- three wheels and one rim beneath him -- Ocon’s relatively undamaged car was left to sustain the team’s point-scoring hopes. The debris from the incident brought out the Safety Car, and set Daniel Ricciardo up for his charge to the podium. 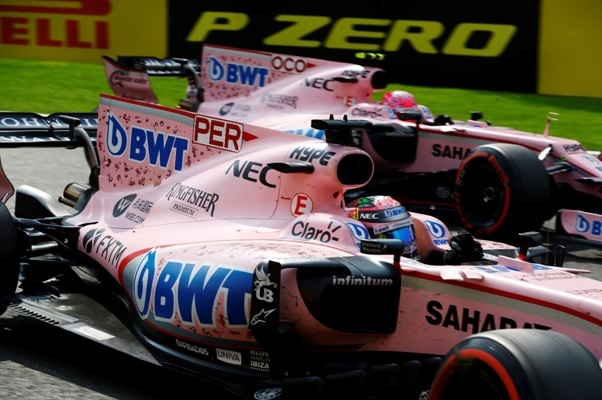 Following the pink pair’s late race clash during the Belgian Grand Prix, Otmar Szafnauer, the team’s chief operating officer, said that his drivers would no longer be free to race each other. “I only saw what you saw [on TV], but it looked like Sergio squeezed Esteban into the wall and came out the loser of that scrap,” Szafnauer told Sky Sports. “In the future they’ll never have that opportunity again. We’ve let them race up until now. If they can’t do it in a manner which is good for the team, then they won’t be racing anymore. 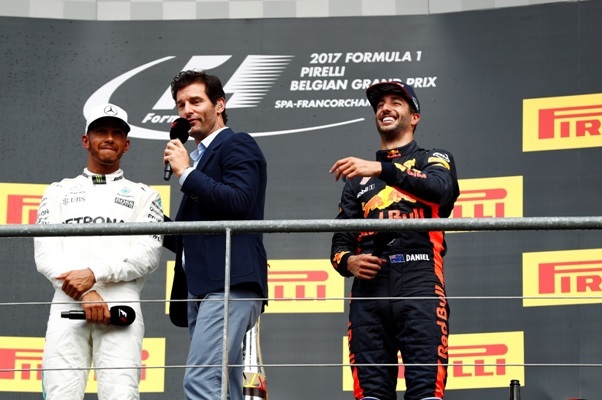 Despite a tough start to the Belgian Grand Prix weekend, when he appeared to lack pace in free practice relative to his teammate, Red Bull’s Daniel Ricciardo was one of the drivers to watch at Spa-Francorchamps on Sunday afternoon. The Australian started sixth on the grid, and remained in that position until Max Verstappen’s retirement gifted him with an extra place. When Kimi Raikkonen was issued a penalty for failing to slow for waved yellow flags, Ricciardo was promoted to fourth. And when the Force India scuffle brought out the Safety Car, Ricciardo capitalised on that fourth place as his only shot at a podium finish. “We got the Safety Car, so for sure Lewis didn’t like it too much,” Ricciardo said in the post-race press conference. “And fair enough, but for me it opened up an opportunity on the restart with Valtteri [Bottas] and I capitalised on that. He was on the softs, I was on the ultra. Ricciardo nailed his move on Bottas at the restart, rocketing into a third place he was then able to hold for the rest of the race, and his fifth P3 finish of the season so far. The popular Red Bull driver is currently fourth in the drivers’ championship standings, having overtaken Raikkonen. 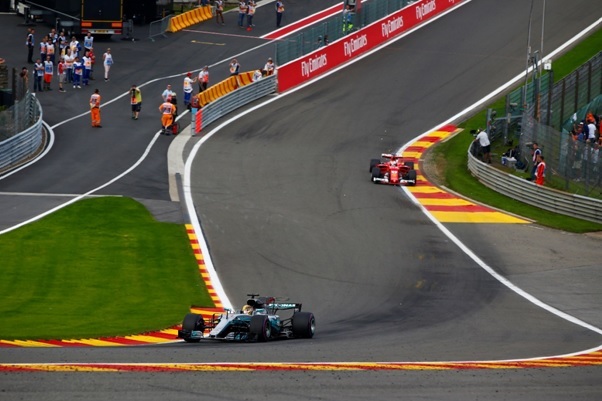 Lewis Hamilton and Sebastian Vettel delivered something of a love-in at the post-race press conference in Spa, with each man praising his rival for their performance throughout the close-fought battle that lasted the 44 laps of the Belgian Grand Prix. 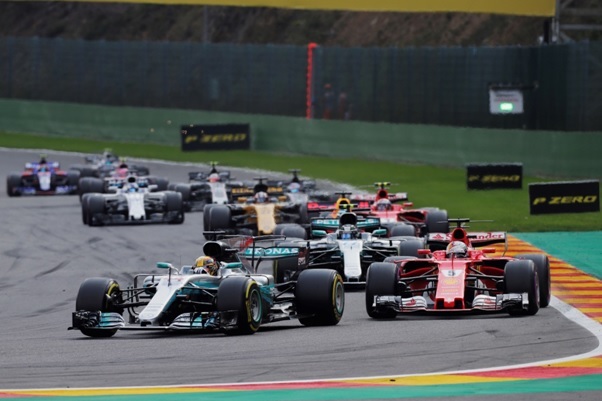 While Hamilton was able to maintain the upper hand from lights to flag, Vettel gave good chase throughout the race, and as the pair danced through the Ardennes forest, lap times closely matched, it was the potential of a wheel-to-wheel battle that thrilled. “You could see exiting Turn 1 I was all over Lewis,” Vettel said after the race. “My restart in the initial part was too good, it was too close. If I had to do it again, maybe I would try something different. We know that they have a very good straight line speed, and in qualy mode at the start of the race, I obviously felt how strong they were up the hill on the start. So I didn’t want to be too far either. Finding that optimum is difficult. Hamilton had high praise for his championship rival. “The Ferraris I think genuinely had the upper hand particularly on race pace throughout the weekend. It was very, very strong today, and I was towing [Vettel] around everywhere, so they were getting a good tow down the straights. “I came to the restart, Sebastian was very, very close, the front tyres weren’t switched on initially. He got a good tow. I think he was a little bit too close on the run out of Turn 1, so he had to lift off as he would have otherwise come by potentially before Eau Rouge which perhaps was a good thing for me because he lost a little bit of performance.